A few weeks ago an amazing bird was reported on the Arizona/New Mexico listserv. 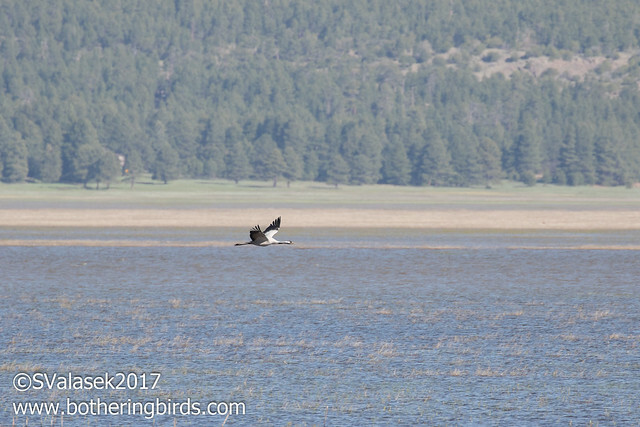 A Common Crane was reported at Mormon Lake, which is near Flagstaff and Sedona Arizona. A mountain lake surrounded by pine forests and cabins. This was the first state record for Arizona. The first report came in on a Thursday and I had to wait until Saturday morning to twitch it, and hope that it was still there. But my kids had soccer games at noon, what to do? I decided to wake up at 4am and make the 3 hour drive, try and see the bird in an hour, then drive back 3 hours for kick-off, easy right? I arrived at the lake just after dawn. It was just me and some elk. I found a turn-off on the East side of the lake and scanned the water for a large, grey shape. I didn't see it, but I saw some birders on the opposite side of the lake. One thing that I've learned is that if you can't find the bird, find the birders. I made my way over and a small group were at their scopes scanning the circumference of the 12 square mile lake. The lake reminded me of the Neuseidlersee in Austria, where I spent a week with a group from Birdwatch Ireland a few years ago (you can read about it here). Like Mormon Lake, it's a wide, shallow lake formed by drainage from the surrounding land. Back to the search. I recognized some fellow twitchers, but some of the birders had made the drive out from California the night before. We ID'd some crane-looking stumps. I spotted a large, flying bird that was very far away, but flew away from the water. But no Cranes. Then, the youngest birders there spotted something from way out to the south. It looked good for a crane shape, it was moving around a bit, but way too far for an ID. Forget Swarovski, we needed a Meade at that range. We all decided to drive to the Southern part of the lake and try to get a closer look. I made my way past some vacation homes to a dead-end road that should get a better vantage point. Some other birders had followed me and we all scanned to no avail. Then, from behind a fence I spotted a grey shape feeding in the grass. It was light above and dark below and looked to be the right size. 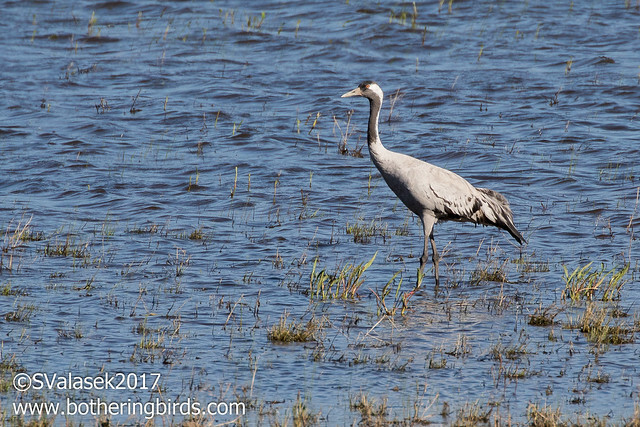 I got my scope on it and ta-da, it was the Common Crane. Can you make it out there in the center of the above photo? We all wanted better looks and then I noticed the road that I had just driven in on a half hour before. We all jumped back into our cars and took off for a closer look. What a great looking bird. 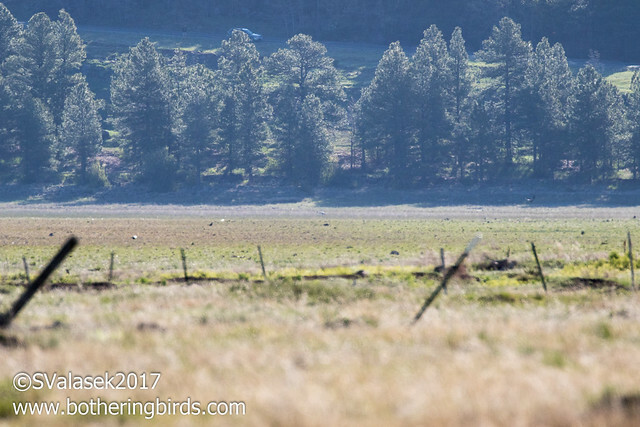 We had an even bigger crowd at this point and we all congratulated the keen-eyed young birder from California who had the initial sighting. We watched it walk back and forth feeding for a few minutes. Then it took off and started flying around. To our delight the crane landed even closer and we got amazing looks at it. What an amazing bird and an amazing lifer an a beautiful location. 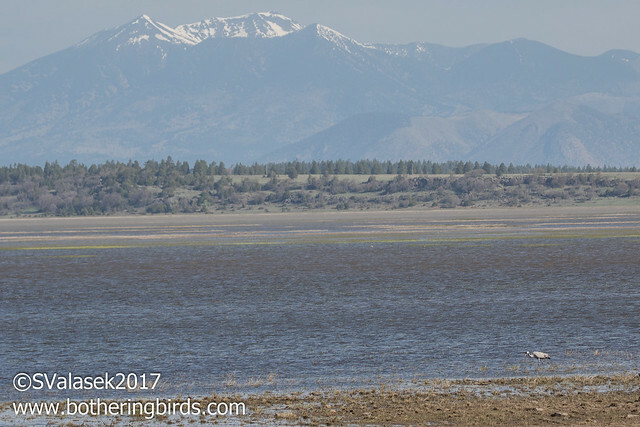 I'm not sure how many Common Cranes see snow-topped mountains in the distance. 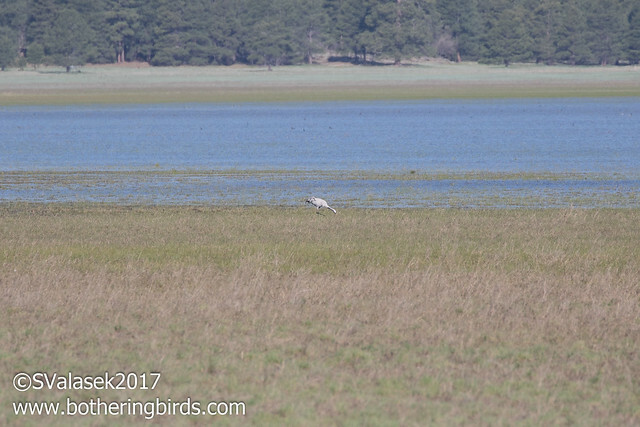 The Crane ended up sticking around for a couple weeks (the last eBird reports seem to be from May 14th) and adds to the amazing run of rarities to visit Arizona in the last year. This was also one of the first outings with my new lens. I added the Canon 100-400mm mark ii recently and sold my 300mm f/4L. I'm really happy with it so far, although I need to sort out a monopod and an easier way to carry it. But it's a quality piece of hardware.